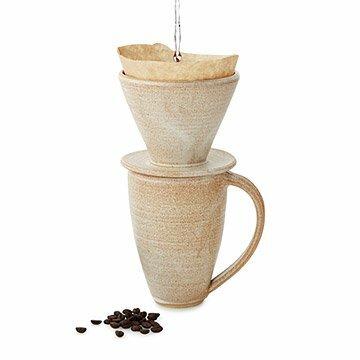 This handcrafted set is perfect for those curious to give the Japanese pour-over-coffee technique a try. A Japanese import with global appeal, the pour-over coffee technique has recently become an ongoing obsession with java enthusiasts. Unlike typical to-go coffee, the pour-over method requires patience and attention in order to reap its rewards. The brew produced is remarkably clean and round, and retains all of the complex layers of flavor steeped in high-quality, single-origin beans. The method requires a level of control and care, but is easy to master and refreshingly low tech. To use, place a filter and coffee beans in the cone, and then pour hot water through in a thin, continuous stream for one to four minutes to maximize extraction. The trick is to saturate but not submerge the grounds in order to allow them to "bloom." Made by Jennifer Creighton out of high-fire stoneware, this stylish starter set is perfect for those curious to give this trend a try, and eager to savor the fruits of their labor. Handmade in Angola, IN. Jennifer Creighton is a full-time studio potter based out of Northeastern Indiana. She earned a Bachelor of Arts in International Studies and a minor in Religious Studies at Defiance College in Defiance, Ohio. She began her work in clay during her senior year of college. Microwave and dishwasher safe. Do not place over open flame. Do not temperature shock; going from extreme hot to cold or vice versa can cause ceramic wares to crack. Mug: 5-5.5” L x 3.5- 4” W x 5.5” H; 18-20 fl. oz." I originally bought just the cone, reasoning that I had my own cups to use it with. But it didn't work with other cups, or even pots; the coffee tended to leak out around the rim. So I bought the matching cup, and find it makes a pleasing pair, as well as working just fine. Get them both. Love using daily for my morning cup of coffee. Easy to use, clean, and takes very little room in cabinets, keeping counter cleared. Have been searching for an artist-made coffee filter cone. Glad to find this one, but it is much smaller than I expected; I typically use a #4 filter for two very strong cups -- this cone would work better w/ a #2 filter. There is no handle either, which I neglected to notice in the picture or write-up, which is inconvenient for our purposes (sailing). Well-made otherwise, w/ groovy grooves along the inner surface for good drainage. Be Careful when washing it. I make coffee daily using a cone filter. This attractive cone is just the right size for one-person coffee. It can be used with many different vessels.